Though the average temperature for the world as a whole was actually slightly lower than the historical average, it was warmer than usual in the northern part of the United States. Matthew Yglesias here correctly points out that this boosted job creation temporarily by allowing for example more construction activity. It could be added that by lowering electricity use and therefore prices it held down price inflation and boosted real wages. This means that underlying strength in the job market was somewhat exaggerated. It also illustrates another point that I've made, namely that a warmer climate has in fact beneficial effects. The Al Gore crowd tries to make us believe that it only has negative effects, but as this illustrates, this simply isn't true. Warren Buffett is one of the most outspoken advocates of higher taxes for the rich in America. He is also the richest man in America so it follows that he advocates that he himself should pay more in taxes. Yet not only does he fail to use the option of setting a good example by voluntarily pay more in taxes, now one of the companies he owns, NetJets, is being sued by the government for tax dodging. They ought to have a picture of Buffett in the dictionary under "hypocrite". "worse unemployment than us, has less growth than us, can hardly feed the people who live there, has a terrible homicide rate, hardly educates their people and has no respect for women,""
In Swedish language (Finland has a large Swedish speaking minority) Helsinki daily Hufvudstadsbladet this has been refered to as Finland being a country of "outbildade, arbetslösa mördare" (uneducated unemployed murderers). That seems to be true, as New Zealand's official unemployment rate is 6.3% compared to 7.5% for Finland. However, the difference isn't exactly dramatic. Not true. Growth was 2.9% in Finland last year, compared to 1.2% in New Zealand. While this partly reflects a cyclical recovery in Finland from the much more severe slump in 2009, growth during the latest 8 year period (2004 to 2011) was slightly higher in Finland, 1.8% versus 1.7%. And if you take New Zealand's higher population growth into account, Finland's record look even better with per capita growth of 1.3% versus 0.7%. "can hardly feed the people who live there"
Clearly untrue if taken literaly as there are no food shortages in Finland. If meant to imply that Finland is poor then it is also clearly untrue. GDP per capita in Finland was €36,000 in 2011 while New Zealand had a GDP per capita of NZ$46,000 which at the current euro/new zealand dollar exchange rate of NZ$1.63/€ is equivalent of €28,000, or more than 20% lower than in Finland. "has a terrible homicide rate"
According to the latest estimates, the intentional homicide rate was 2.0 per 100,000 people in Finland compared to 1.76 in New Zealand. Finland's homicide rate is thus somewhat higher than in New Zealand, but hardly as dramatic as the term "terrible" implies. According to the latest international comparison of school results, PISA, the mean score in science, mathematics and reading was 551, 540 and 536 in Finland compared to 532. 519 and 522 for New Zealand. If Finland hardly educates its people, then New Zealand doesn't do it at all in other words. "has no respect for women,"
Just what aspect of Finland's society is misogynic is unclear as women in Finland has equal rights and as things like "honor murders" and female genital mutilation are extremely rare (in fact completely non-existent outside of certain immigrant groups). Women are also well represented in power positions in Finland as the President until just recently, Tarja Halonen, is a woman, as is the current Finance minister Jutta Urpilainen (pictured below) and nearly half of the other cabinet ministers. Brownlee's assertioms about Finland are in other words all completely untrue except for the ones about unemployment and homicides, but even in those cases he exaggerates the difference. Scott Sumner notes that Britain both have low nominal growth and high inflation, or as he puts it have both a demand and a supply problem, but argues that the inflation numbers are "biased" because of a VAT increase. Actually though, VAT increases, just like other tax increases, do create "supply problems" since they will cause the supply of goods and services at the old prices to decrease, raising prices and lowering real output. Tax increases, including VAT increases, are in other words a recipe for stagflation. Britain may have other "supply problems", but the increases in the VAT and various other taxes in recent years are certainly among the most important. But when growth picks up, investment recovers and along with it the capital stock. Mr Thoma says policy makers should not hold back on stimulative policies for fear of hitting a short-run supply ceiling, since that ceiling will rise as demand and investment pick up. It is true that a higher level of investment will, assuming the investments are sound, increase long term growth and it is also true that this factor will limit the effect on price inflation that monetary inflation has. However, investments that are the result of unsustainable monetary inflation will not increase long term growth as they will be revealed to be malinvestments during the following slumps. And what's worse, the slumps that follows often tends to drag down some businesses that are fundamentally sound, while many workers lose skills (and fails to get more useful skills that they might have gotten) in more useful industries. But isn't it possible that some investments in reasearch and development that are financed by inflationary credit could boost output permanently? Well, yes that is possible, just like it is possible that if you gave all unemployed workers $200,000 each to start businesses then some of those businesses could become success stories. But it is highly unlikely that these successes will become common enough to compensate for the damage done to other businesses and workers during slumps and the high cost for the government respectively. Who Cares About Reality When You Got Estimates Of Misleading Concepts? "G.I." at the Economist has an odd argument against the theory that a recession causes permanent damage to the level of output, namely that the Congressional Budget Office revised up its estimate of "potential GDP" after the recession of 2001. But considering that growth has been the weakest since the 1930s in the decade that followed, and was relatively weak even before the 2007-09 recession the view that "potential growth" had risen was clearly wrong. I have written before about the problems with the concept of potential GDP. I stumbled in to a British dataset called "GDP and the labour market" and found some interesting things. Compared to other countries struck by the economic crisis of the last few years, Britain have so far had only a modest problem with unemployment. It's 8.4% unemployment rate is significantly higher than a few years ago, but compared with the 14-15% unemployment rate in Portugal and Ireland, the nearly 20% unemployment rate in Greece and the 23-24% unemployment rate in Spain, it is low (Italy is more similar to Britain in unemployment with a 9.2% unemployment rate). As the below chart illustrates, Britain has only had a modest drop in employment. If you take Britain's relatively high population growth into account, it looks worse, with a drop in employment relative to population of more than 5%, but that drop is still a lot lower than in Ireland, Portugal, Greece or Spain. However, in terms of real wages, Britain has fared as bad or worse than the other countries as this chart illustrates. As you can see, earnings growth have consistently trailed inflation, and if you analyze the data in the release, as I have, you'll find that during the latest 5 year period the average real earnings of people with jobs in Britain has fallen as much as 10%. This reflects a big drop in the number of hours employed Britons work even as productivity has been roughly unchanged. So while Britain's more inflationary path seems to have limited its unemployment problem, it hasn't helped overall growth, and has contributed to a greater decline in real wages for the employed. Buried within the latest Flow of Funds report was the first preliminary estimates of Q4 2011 corporate profits and national income. The reports showed that national income increased slower than GDP, 2.9% in nominal terms versus 3.9% for GDP, or 1.8% and 2.8% respectively in real terms after adjusting for the 1.1% gain in the domestic demand deflator. The report also showed that corporate profits had the first quarterly decline in years, though they are still up significantly compared to a year earlier. This quarterly might be temporary but considering how elevated they are now and the factors mentioned below they are probably not far from their peak. What is telling though is that this decline in profits wasn't primarily the result of higher real hourly wages, though they rose slightly on the quarter while falling on the year, but of a rapid decline in productivity growth. Real gain in national income was as I wrote above 1.8%, but aggregate hours worked rose 2.8%. That comparison is partly misleading since national income includes the government sector while the hours worked number doesn't, but even after adjusting for that, we're still talking about roughly unchanged productivity, and a gain of less than 1% for the year. That productivity has stopped growing means that unless the trend is reversed or real wages continues to fall, profits can no longer grow. And with the labor market strengthening, it will be harder for firms to get away with cutting real wages. They might have a better shot at increasing productivity, but productivity growth has been on a downward trend basically for the last decade. There was a lot of hand wringing over the fact that China published a record trade deficit in February. Despite the fact that it was caused by a big jump in imports this was interpreted as evidence of a dramatic weakening of the Chinese economy as it meant that net exports weakened. Ironically though, a big increase in its trade surplus in February was also interpreted as signs of a dramatic slowdown since the big drop in imports indicated falling demand. The truth is however that although these numbers support the view that economic growth is slowing in China, the shift isn't as big as the isolated numbers alome suggest. The by far most important reason for both the very high trade surplus in January and the record trade deficit in February is the Chinese New Year, also known as the Lunar New Year. Because it is a very important holiday in China most businesses are closed during those days. Last year it was in February, this year it was in January, meaning that a lot of imports that was made in January last year was shifted to February this year. The Chinese New Year also shifted a lot of exports from January to February, but this effect was smaller. Add to that the fact that February in all countries had 29 days this year instead of 28 as in most years, and we have a very big seasonal effect. the year, particularly the months before Christmas when it delivers a lot of toys and other Christmas presents. The big slowdown in growth of both exports and imports certainly supports the view that China's economic growth is slowing down. However, the slowdown isn't as dramatic as the interpretations of either January's or February's numbers suggest. If China had tried to use seasonal- and calendar adjustments of its data this misinterpretation hadn't arisen. Commenting on yesterday's U.S. economic numbers, which showed an increase in employment but also in the trade deficit, Peter Schiff more or less correctly wrote that this showed that the upswing had an unsound basis. To the extent he means that the increase in the trade deficit is a symptom showing that it is driven by the 9.6% gain in money supply and a 12.2% increase in commercial & industrial loans , increases that are unsustainable, he is right. Despite some marginal improvement in manufacturing employment, new hires have been overwhelmingly in the service sector. We need a shrinking service sector and a shrinking trade deficit. As it is, newly employed Americans are spending money on imported products that America should be producing. The trade figures are evidence that our spending has increased while our economy has not. It is also shocking to consider that we are importing more with 8.3% unemployment than we were five years ago when unemployment was near 5%. I can only imagine how large the deficit would be if we had even more service sector jobs. One example of this is Hong Kong. Hong Kong is one of the most, if not the most, service oriented economies in the world with 93% of its economy being in the service sector and only 1.8% in manufacturing (the rest is almost all construction and utility (electricity etc.) production, only 0.1% is fishing and agriculture) as almost all Hong Kong manufacturers have moved their production to mainland China. By contrast, the service sector is only about 65% of GDP in the United States. If Schiff's trade deficit theory was correct, then Hong Kong would have an enormous trade deficit. But while Hong Kong does indeed have an enormous trade deficit in goods, HK$436 billion (US$56 billion), roughly 23% of GDP it has an ever greater surplus in services, HK$507 billion, slightly less than 27% of GDP. Its overall trade surplus of nearly 4% of GDP is almost as large proportionally as America's deficit. Reversed Roles For Britain, U.S.
As I've explained before, the answer to the question of whether higher prices are good or bad depends on whether you're a seller or a buyer. If you're a seller, then higher prices are good, if you're a buyer they're bad. In the question of oil prices, this means that countries that are net exporters of oil, such as Iran, Saudia Arabia, Russia, Norway and Canada, benefits if oil becomes more expensive, while countries that are net importers, such as China, Japan, Germany, France and Sweden loses if oil becomes more expensive. Until recently, the United States was a big net importer of oil, while Britain was a small net exporter of oil. This meant that higher oil prices harmed the U.S. economy, but had a slightly positive effect on the U.K. economy. This is to some extent changing. While the U.S is still a large net importer, a combination of falling consumption and rising production in states like North Dakota has significantly reduced net imports, meaning that while a higher oil price is still negative for the U.S. economy, it has a smaller impact than a few years ago. By contrast, a dramatic drop in U.K. oil production in recent years means that not Britain has gone from making small gains from a higher oil price to suffering great losses. This is evident in the latest U.K. industrial production report. While manufacturing alone rose in January by 0.1% compared to the previous month and 0.3% compared to a year earlier, overall industrial production fell by 0.4% compared to the previous month and 3.8% compared to a year earlier because "oil and gas extraction" fell by 3.3% compared to the previous month and 23.9% compared to a year earlier. Compared to 2008, oil and gas extraction is down by 37.5%. While U.K. consumption is also down, it has fallen by far less than production, turning Britain from a net exporter to a net importer. The MMTers would say that the Austrian view of fractional reserve banking is not really applicable in this day and age. The activity that Murray Rothbard described as “making loans out of thin air” and regarded as a form of counterfeiting is actually much more pervasive than he understood. In the modern day and age, banks lend without regard to their reserves. The loan officer never calls the Federal Reserve to check whether reserves are adequate. Instead, banks make loans just the way other businesses invest in long-term projects—with an eye to profit. That is, banks lend according to their view of the likelihood of making a profit based on the risk factors of borrowers and the risk-premium the bank can charge them. Those new bank loans create new deposits in the banking system. Of course, bank loans do need to be financed in some way, because of the reserve requirements that banks must meet every other Wednesday. But a bank doesn’t need a depositor to drop by on Tuesday afternoon with a check or a new investor to arrive with a briefcase full of new capital. They can meet the reserve requirement by borrowing on the Fed Funds market. And there are always enough reserves to borrow because the bank created additional reserves by making the loan in the first place. In a pinch, they can borrow from the discount window of the Federal Reserve. The point is that interest rates no longer reflect savings rates. The interest rate signal is broken by the operations of the modern monetary system. Increases in savings don’t show up as falling interest rates, and decreases don’t show up as rising interest rates. don't exist. What he is wrong about is its relevance for ABCT. Though reserve requirements have often been mentioned in some texts about ABCT, they are in no way something that ABCT logically presupposes. Reserve requirements or not, the Fed nevertheless controls interest rates, particularly at the short end of the maturity market. And while it is true that interest rates in the modern monetary system don't reflect the natural savings rate, that fact doesn't contradict ABCT. Quite to the contrary, the whole point of ABCT is that business cycles are created by the Fed-controlled monetary system pushing down interest rates below its natural level. 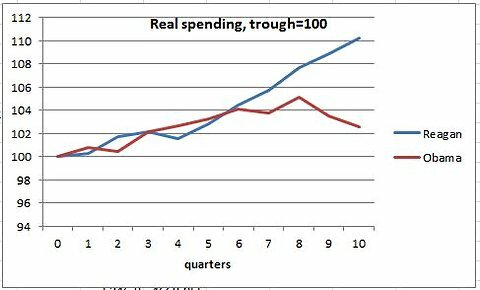 Paul Krugman claims, both in his latest column and in a recent blog post, that because government spending rose a lot more during the first 10 quarters of the Reagan recovery than the Obama recover that the Obama recovery would have been just as strong if only government spending had increased equally. His proof? Well, he argues that this is the case because Keynesian models show that with the multiplier effect from these purchases growth would have been just as strong. But that of course assumes that we buy into the legitimacy of these models, something that Krugman and others have failed to do on a theoretical basis. But doesn't the empirical fact that the stronger Reagan recovery was associated with a higher increase in government spending prove the accuracy of these models? No, because first of all, you can't establish the legitimacy of theoretical models with such simple comparisons as there are so many other factors involved. And secondly, if you look closer at the chart (below) you'll see that for the first five quarters government spending increased equally. Yet during those five quarters when government spending increased equally, average annualized GDP growth was 3.1% during Obama and 7.8% during Reagan. During the following five quarters of the recovery when spending increased during Reagan and fell during Obama growth was 1.8% during Obama and 3.7% during Reagan. So the facts are the following: growth was consistently much higher during the Reagan recovery than in the Obama recovery but exceeded it by a lot more during the phase when government spending increased equally than when spending rose in the Reagan recovery compared to the Obama recovery. If really government spending had the strong effect Krugman imagined we would have expected at the very least that the gap would have been smaller during the period when spending increased equally. Note also that compared to GDP, government spending fell more during Reagan even for the 10 quarter period as a whole. Government spending may have risen 7 percentage points (3% versus 10%) less during Obama, but the gap in cumulative GDP growth was 9 percentage points (6% versus 15%). Iceland To Adopt The Canadian Dollar As Currency? The Globe and Mail reports that Iceland is considering to adopt the Canadian dollar as currency. That would be a somewhat odd choice of currency. Normally when countries unilaterally adopt foreign currencies or pegs their currencies to other currencies, it is currencies of countries which you have extensive trade, like El Salvador and Ecuador with the U.S. dollar, Kosovo, Montenegro and Andorra with the euro or Liechtenstein with the Swiss franc. The reason for this is that this creates the largest possible trading gains. Having a common currency with countries that you have little trade can't produce much gains. Yet in 2010 Canada received less than 0.5% of Iceland's exports and supplied less than 2% of its imports. The Norwegian krone or the euro would be much more natural choices for Iceland. The Canadian dollar might still be an improvement from a monetary policy point of view given Iceland's inflationist past (which contrary to the widespread myth has not been successful in solving its problems). The time has come again for a fundraiser. While often interestimg, this blog is very time consuming. To ensure its survival I need for readers to contribute some of the value they get from this blog. Therefore, make sure to contribute according to the value you get from this blog and as much as you can afford. Note that if you donate non-insignificant amounts then you will earn the right to request that I analyze and discuss whatever issue you like. So, press the "donate"-button in the right side bar, and donate now (or as soon as possible)!